Phase I & II is a fully developed bare land condominium consisting of 180 privately-owned RV lots. 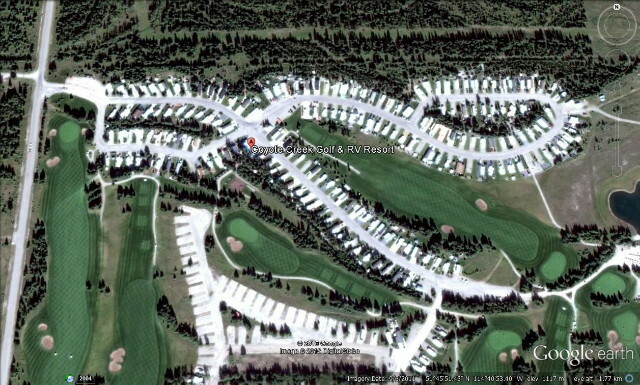 The RV resort is located 3.3 kilometers west and 3.3 kilometers south of the town of Sundre, Alberta. Sundre is located approximately 40 kms west of Olds, and about a one hour drive from Calgary and Red Deer. Those of us who have chosen Coyote Creek RV Resort as our "home away from home" know exactly what it is that sets our resort apart from other holiday spots. It's just that it's a little difficult to explain. We could talk about the beautiful, natural woodland that surrounds the park. We could talk about the different kinds of songbirds that share our morning coffee. Or we could tell you how nice it is to have such a great space to sit back and relax, play a round of golf, and yet have all the amenities of a community within five minutes of our holiday place. But really, until you come out here and walk around, visit with the neighbours, no matter how hard we try, we just can't do it justice. And that's why we are equally as passionate about the condo corporation itself. The owners take pride in their property, and want to keep this resort as beautiful and well cared for as it is. Besides being a first class relaxation resort, Coyote Creek has also provided its owners with a sound financial investment. This website serves the condo's owners and the tenants of owners, providing information about the resort, its bylaws and policies, and points of contact. Coyote Creek RV Resort is a gated, secure community, so we encourage you to make an appointment to view the resort. You can also contact the owners of the lots for sale directly for viewing. You may just find yourself joining our Coyote Creek community, and making it a part of your family's legacy, and future.